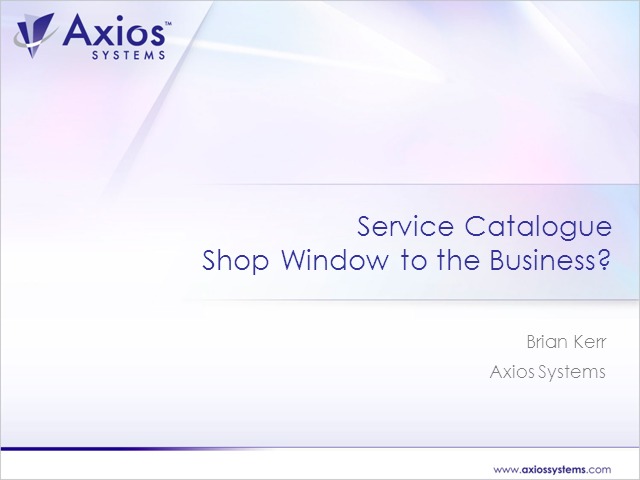 Service Catalogue: the Shop Window to the Business? What exactly is a Service Catalogue and how should businesses use them? Are we too caught up in the idea that the Service Catalogue is for IT services only? Could the Service Catalogue become a "one-stop-shop" for non-IT functions as well, for example, Human Resources or Facilities Management? Brian Kerr has worked in the IT industry for 35 years. He has a vast amount of experience in delivering ITIL based Service Management solutions worldwide and is a qualified ITIL Service Manager and project director at Axios Systems, becoming the 1st in the world to achieve BS 15000 certification, now ISO/IEC 20000 (the international standard for IT Service Management). Title: Service Catalogue: the Shop Window to the Business?